Sunday features a four-game slate starting at 1 p.m. ET. Damian Lillard enters the postseason in poor recent form, posting an average Plus/Minus of -4.36 over his past 10 games on DraftKings. That said, there’s a lot to like about him on today’s slate. He’s still averaged a strong 1.34 DraftKings points per minute over the past month, and he’s seen a team-high usage bump of +4.4% with Jusuf Nurkic off the court this season. He’s also currently projected for 39.5 minutes in our NBA Models, which is the top mark on the slate regardless of position. Lillard’s matchup vs. the Thunder is also one of the best of the day. OKC played at the sixth-fastest pace during the regular season, and Lillard’s Opponent Plus/Minus of +2.10 is the top mark at the position today. He’s a strong play across the industry, but he’s particularly appealing on DraftKings given his Bargain Rating of 97% for that site. Darren Collison has seen a price decrease of $1,400 over the past month on DraftKings, making him a steal at his current $4,800 price tag. Collison has averaged a strong 0.99 DraftKings points per minute over the past month, resulting in an average of 25.5 fantasy points per game. He should also see a boost in playing time during the playoffs after playing just 24.7 minutes per game over his final five regular-season contests. Russell Westbrook leads the position with 14 DraftKings Pro Trends, and his $10,300 salary comes with a Bargain Rating of 98%. That’s an incredibly low price tag for Westbrook, who has averaged a +3.69 Plus/Minus at comparable salaries this season (per our NBA Trends tool). Most of the best values at point guard on today’s slate reside on DraftKings, but Reggie Jackson stands out on FanDuel, where he is priced at just $5,100, resulting in a Bargain Rating of 82%. He’s averaged 1.00 FanDuel points per minute over the past month and would see a huge boost in value if Blake Griffin (knee, questionable) is ultimately unable to suit up. James Harden has been priced down to just $10,100 on DraftKings for Houston’s Game 1 matchup vs. the Jazz, making him almost impossible to fade. Harden has averaged 63.1 DraftKings points per game over the past month and scored 71.5 or more in each of his past two matchups vs. the Jazz. He also leads the position with 14 DraftKings Pro Trends. His FanDuel salary of $12,300 makes things more interesting. Should you pay up? History says no, as Harden has averaged a FanDuel Plus/Minus of -0.53 at comparable price points. The Jazz still represent a tough matchup for Harden despite his recent success against them, so despite the fact that he possesses arguably the highest ceiling on the slate, there are better values available on FanDuel. Jaylen Brown is one of those aforementioned options. Brown is averaging 0.89 FanDuel points per minute this season, and he should see a solid boost in playing time with Marcus Smart (oblique) out of the lineup. Celtics-Pacers is probably a game you want to avoid for the most part – the over/under of 209.5 is the lowest mark on the slate – but Brown is simply too cheap to pass up. C.J. McCollum may not be 100% after a knee injury caused him to miss 11 of the past 13 games, but he will reportedly play without a minute’s limit today vs. the Thunder. That makes him an appealing target at just $5,800 on DraftKings, as he’s averaged a Plus/Minus of +6.49 at comparable salaries. Khris Middleton leads the position with 10 Pro Trends on FanDuel, where his $7,100 salary comes with a Bargain Rating of 70%. He’s averaged 1.25 FanDuel points per minute over the past month and should continue to benefit from the absence of Malcolm Brogdon (foot). One of the biggest questions heading into the postseason – at least from a fantasy perspective – is just how much head coach Mike Budenholzer will increase Giannis Antetokounmpo’s workload. Budenholzer has done a great job managing Antetokounmpo’s minutes all season, but the Greek Freak’s average of just 32.8 minutes per game has limited his fantasy output at times. Case in point: Giannis averaged a Plus/Minus of just +0.72 on DraftKings this season despite possessing the highest per-minute output of any player in the league. If Giannis sees a big bump in minutes during the postseason, he has the potential to make his current salary look like a joke. He’s averaging a ridiculous 1.98 DraftKings points per minute over the past month, and his $10,400 salary on DraftKings comes with a Bargain Rating of 99%. The biggest concern with Giannis is the blowout factor, as the Bucks are currently 13-point favorites vs. the Pistons. Moe Harkless has been a solid source of value over his past 10 games, posting an average Plus/Minus of +4.59 on DraftKings. He’s increased his fantasy production to 0.87 DraftKings points per minute over the past month and is currently projected for 28.0 minutes in our NBA Models. He should be one of the highest-owned value options on the slate. Jae Crowder is a slightly more contrarian option than Harkless, making him a really intriguing GPP option at $4,600 on FanDuel. Crowder is averaging 0.90 FanDuel points per minute over the past month, and this matchup vs. the Rockets appears to suit his skill set more than Derrick Favors’. Crowder played at least 31.5 minutes in three of four regular season games against Houston and should find himself on the right side of the playing time split all series long. Paul George has not been the same player over the second half of the season as he continues to deal with a right shoulder injury, but that hasn’t stopped him from logging a huge workload. He’s coming off 42 minutes in his last regular season contest and leads the position with 14 Pro Trends on DraftKings, where his $9,200 salary comes with a Bargain Rating of 97%. Blake Griffin is the only power forward that really qualifies as a stud today, but he’s not a lock to suit up vs. the Bucks. He missed the Pistons’ final regular-season contest, which they needed to win just to secure their playoff spot. He was also limited to 18.4 minutes in the game prior. He will almost certainly be low-owned if he is able to play, but I wouldn’t feel comfortable targeting him against a Bucks squad that ranks first in defensive efficiency. PJ Tucker isn’t very productive when he’s on the court – he’s averaged just 0.59 DraftKings points per minute over the past month – but he’s able to make up for it through sheer volume. 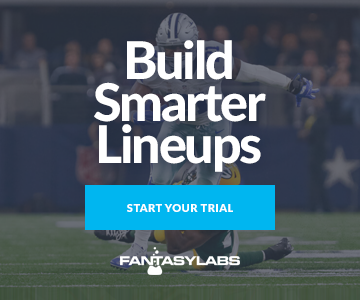 He’s currently projected for 32.5 minutes, and it’s impossible to ignore that kind of workload on such a small slate when he’s priced at $3,400 on DraftKings. Historically, players with comparable salaries and minutes projections have averaged a Plus/Minus of +4.59. Thaddeus Young is one of the best values of the day on FanDuel, where his $5,400 salary comes with a Bargain Rating of 91%. His 12 Pro Trends are tied with Griffin for the most at the position, and players with a comparable number of Pro Trends and salary have historically averaged a Plus/Minus of +4.53. Is it possible that Jayson Tatum has just been saving himself for the postseason? Celtics’ fans are certainly hoping so. Regardless, he’s worth exposure at $5,700 on DraftKings given his Bargain Rating of 96%. Andre Drummond has dominated from a fantasy perspective recently. He’s averaged 50.9 DraftKings points per game over the past month, resulting in a Consistency Rating of 93%. Drummond would also see a big boost in value if Griffin is unable to play. He’s averaged 52.36 DraftKings points per game in seven contests without Griffin this season, resulting in an average Plus/Minus of +6.9 on DraftKings. The Bucks have been susceptible to opposing centers this season, and Drummond’s Opponent Plus/Minus of +2.26 ranks third at the position. Brook Lopez is one of the only centers that is a better value on FanDuel than DraftKings today. Lopez is priced at $5,800 on FanDuel, resulting in a Bargain Rating of 70%, and he’s increased his fantasy production to 1.03 FanDuel points per minute over the past month. He should see plenty of playing time in this series to try and combat the size of Drummond. Al Horford is currently dealing with a knee injury, but he’s probable to suit up against Indiana. He averaged a stout +6.71 DraftKings Plus/Minus over his past 10 games and 1.25 DraftKings points per minute over the past month. Clint Capela has struggled vs. the Jazz this season, but he did a great job against them in the postseason last year, averaging 13.0 points, 10.2 rebounds, 3.6 blocks, and 1.8 steals over five contests. That makes him an appealing target at just $6,700 on DraftKings, where his Bargain Rating of 99% is tied for first at the position.